A Canadian member of parliament is proposing a ban on asbestos-containing brake pads in her province, providing a safer work environment for auto mechanics in Ontario. 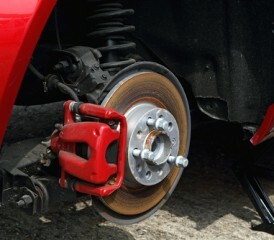 Used in thousands of products, including auto brake pads, asbestos becomes dangerous when it is damaged. When damaged, its fibers become airborne and can be inhaled, setting the stage for a lengthy latency period before an asbestos related disease develops. Liz Sandals, a member of provincial parliament (MPP) representing the area of Guelph, recently proposed a bill that would be Canada’s first law to stop the importing of asbestos brake pads. Whether the bill will pass, and if the nation will follow suit if it does pass, remains to be seen. Shannon Groves is a retired mechanic in Canada who developed mesothelioma from asbestos exposure as a kid. Mesothelioma is a cancer of the lining of the lungs that typically yields a poor chance of survival. Having limited treatment options, this cancer only affects approximately 3,000 Americans per year. The only known cause of mesothelioma is asbestos exposure. Groves loved working with his father in their garage as a child. The two worked around the car on a regular basis. This hobby cost him his health. Sandal’s bill would prevent future mechanics and people like Groves from developing this deadly disease. Because of the 20- to 50-year latency period often associated with asbestos-related diseases, those who were recently exposed to asbestos from brake pads may not discover it for decades to come. According to CBC News, most mechanics already believed that asbestos was banned in brake pads. However, to the contrary, asbestos brake pads shipments valued at over $2.6 million entered Canada just last year alone, demonstrating recent importation and distribution of the toxic pads. Some mechanics are already taking precautions, regardless of the fate of the bill. The hazards associated with asbestos exposure have been well documented. Beyond mesothelioma, exposure to this harmful mineral has been linked to lung cancer, asbestosis, pleural plaques and other cancers. Sandals’ attempt to put a halt to asbestos brake pads in Ontario is consistent with many developed nations, but is seems to contradict to her own national government’s position. Canada once was one of the largest asbestos producers in the world and still has mines capable of producing asbestos. The nation ships thousands of tons of chrysotile asbestos to developing nations like India, while claiming that some other forms of asbestos are dangerous. In addition to brake pads, thousands of other products have been known to contain asbestos products. Canada has recognized the value of asbestos in countless products like construction materials and has yet to definitively take a stand against the mineral. Regulations exist but no national ban on asbestos exists, unlike many other developed nations. Critics argue that the Canadian government has yet to take steps in banning the mineral because of the financial benefits that it receives from asbestos exporting and mining activities.